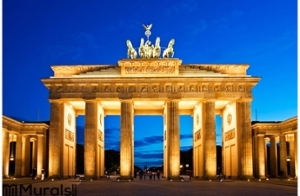 The Berlin to London trip features a mix of some of the great cities of Europe blended with stops at lovely and significant small cities that highlight the different cultures of Europe, some of its scenic beauty, and major historical events. The great cities include Berlin—the focal point of the Cold War and today a place of compelling green spaces; Munich—home of Bavarian Germany and the Oktoberfest; and London—the center of British life and still the hub world culture. The smaller cities include Wittenberg—home of the Protestant Reformation and Martin Luther; Zürich—with its own touch of the Alpine and lake beauty of Switzerland; Reims—heart of the ordered countryside of the Champagne region of France; and Bruges—the well-preserved remnant of Belgian medieval commercial life, with its lace-making, chocolates, and many picturesque waterways. Themes of the trip include the history of the Protestant Reformation with visits to the homes of Martin Luther and Ulrich Zwingli; the wars that shaped modern Europe with the landscape of World War I in Bruges, sobering concentration camps such as Dachau outside of Munich, the site of the Berlin Wall, and the Churchill war rooms in London; and the rich cultural heritage of Europe, with stops in Germany, Switzerland, France, Belgium, and England. Days 2-4 Berlin, Germany. Visits to the site of the Berlin Wall; sites of the old Prussian government, notably the Reichstag and the Brandenburg Gate; the concentration camp Sachsenhausen; and dozens of museum opportunities, including the Pergamon Museum of ancient Asia Minor on Museum Island, and many, many others (the Lipstick Museum, anyone?). Days 5-6 Wittenberg, Germany. Many sites connected to Martin Luther and other leaders of the German Reformation, including the place where Luther posted the 95 Theses in 1517. Days 7-9 Munich, Germany. The heart of Bavarian Germany is the Marienplatz, with its Glockenspiel clock, and the Hofbräuhaus. Museum opportunities include the Deutsches Museum of science and technology, the top-notch Pinakotheke art museums, and the BMW Museum. Our visit will include a trip to the Dachau Concentration Camp Memorial. Days 10-12 Zürich, Switzerland. Visits include the cobble streets of Old Town along scenic Lake Zürich and sites related to the life and work of Protestant reformer Ulrich Zwingli. There will be opportunity for a day trip into the Alpine setting of the surrounding Swiss countryside. Days 13-14 Reims, France. The heart of the Champagne region of France will include visits to Reims Cathedral, one of the most spectacular of the European Gothic cathedrals and just one of several major medieval buildings, and a World War II museum located in the building where General Eisenhower made his headquarters. Days 15-16 Bruges, Belgium. This hidden gem of medieval and early modern Belgian commercial life offers canals and waterways, a central square with historic buildings, and traditional Belgian crafts of lace-making and chocolate making. The Western front of World War I ran near her and it may be possible to arrange a trip to visit this sobering terrain. Days 17-21 London, England. The opportunities in one of the world’s great cities are endless. We will visit traditional sites such as Westminster Abbey, Big Ben, Trafalgar Square, and the Picadilly Circus. The London theater offers dozens of shows on any give night. Numerous churches and other landmarks show London’s Christian heritage. Museum opportunities include the British Museum, the National Gallery, the Victoria and Albert Museum, the Imperial War Museum, and the Tower of London.